Barr still won't say whether he's shown the Muller report to the White House. Attorney General William Barr on Wednesday refused – for a second day – to say whether the White House has seen special counsel Robert Mueller’s investigative report, though he did open the door wider to the possibility that Congress would see more of it than he has previously acknowledged. He also told a Senate hearing he didn't know whether Mueller supported his controvsial conclusion that President Donald Trump had not obstructed justice. Democrats are insisting that Barr release the entire unredacted report to Congress. While Barr said Tuesday he would make a redacted version of the report public "within a week," on Wednesday said he would do so "hopefully, next week." He repeated that he was trying to be as "transparent as possible." 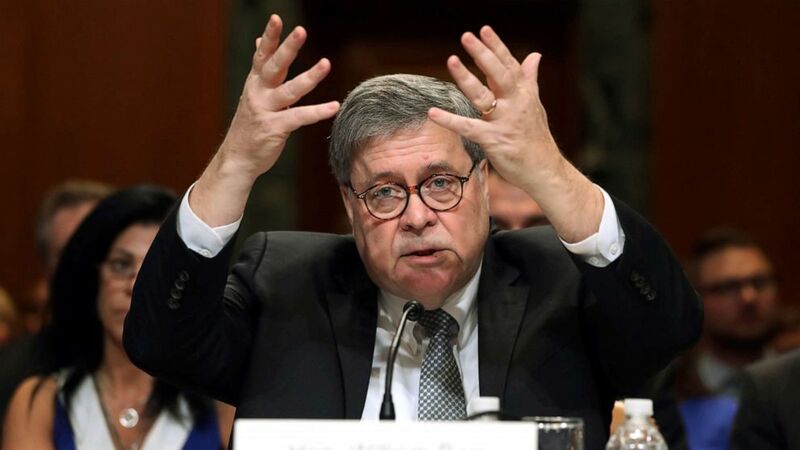 (Andrew Harnik/AP) Attorney General William Barr gestures as he speaks before a Senate Appropriations subcommittee to make his Justice Department budget request, April 10, 2019, in Washington. “The fact that information is classified doesn't mean that Congress can't see it,” Barr said and indicated that he might be open to negotiating with lawmakers regarding grand jury material, something Democrats have insisted on seeing. Asked whether White House has seen or been briefed on Mueller report, AG Barr says, "I've said what I'm going to say about the report today." Sen. Patrick Leahy, D-Vt., asked Barr if Mueller had asked him to leave the question of whether Trump had engaged in obstruction of justice to Congress. But Barr said that’s “generally the way it works" at the Justice Department. Under pointed questioning from Democrat Sen. Chris Van Hollen of Maryland, who asked if Barr agreed with the special counsel “that there were difficult issues of law and fact” as he considered whether Trump obstructed justice, the attorney general repeatedly refused to answer. “It was a conclusion of a number of people, including me, obviously, as the attorney general,” Barr said, adding that he looks forward to explaining his position once the full report has been released. “Did Bob Mueller support your conclusion?” Van Hollen then asked. “I don't know whether Bob Mueller supported my conclusion,” Barr shot back. Sen. Chris van Hollen: "Did Bob Mueller support your conclusion" on obstruction of justice? But Barr may have raised the eyebrows the most when he suggested that he thought “spying” on the Trump campaign may have occurred in the course of the government’s counterintelligence investigation into Russian meddling in the 2016 election. Shaheen appeared shocked, pausing before asking, “You’re not suggesting, though, that spying occurred? “I haven't set up a team yet, but I have in mind having some colleagues help me pull all this information together and let me know whether there are some areas that should be looked at,” Barr said, expanding on a promise he made at his confirmation hearing earlier this year. “I also want to make clear, this is not launching an investigation of the FBI. Frankly, to the extent there were any issues at the FBI, I do not view it as a problem that's endemic to the FBI. I think there was probably failure among a group of leaders there at the upper echelon." It was an exchange sure to fuel Democrats’ suspicions that the attorney general is doing the bidding of Trump and congressional Republicans. Many Democrats have already accused Barr of being biased in Trump's favor when he said he had concluded in his March 24 letter to Congress that the president did not commit obstruction of justice. They also point to a June 2018 memo Barr wrote arguing that the president, by very nature of his position as head of the government, cannot obstruct justice. Over the past two years, Trump has repeatedly accused the FBI, particularly under former Director James Comey, whom Trump fired, of mishandling the Russia probe. There is just one known case of Foreign Intelligence Surveillance Act (FISA) surveillance against a single person associated with the Trump campaign — adviser Carter Page -- who had previously been targeted for recruitment by Russians and who was alleged to be working for the Kremlin, although it's now believed that was not the case. “I’m sure this is exactly what the president wanted him to say,” Schiff told ABC Senior Congressional Correspondent Mary Bruce. “I’m sure that was music to Donald Trump’s ears but I’m sure it was also a body blow to the hardworking men and women of the FBI,” he said.